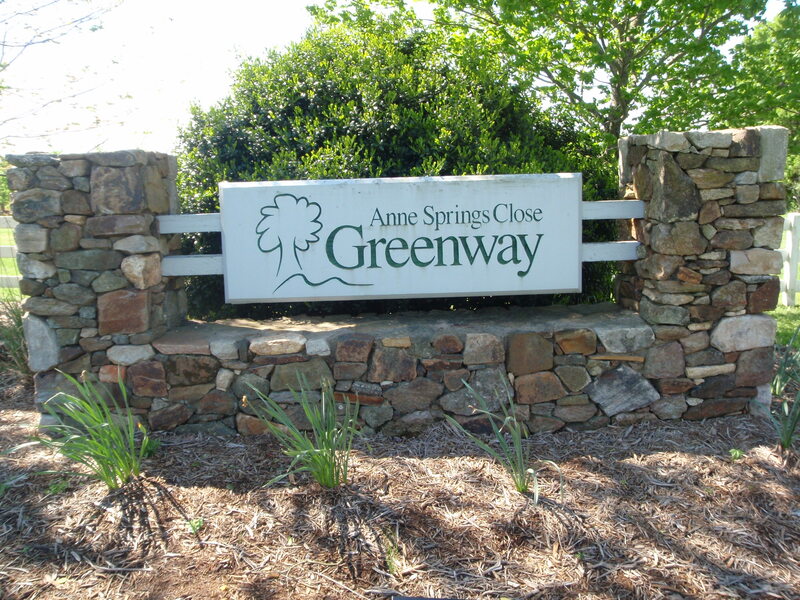 When I was driving around to find the Community Cafe yesterday, I noticed a sign for Anne Springs Close Greenway, and greenways usually mean there’s some good walking trails, so that’s where I headed this morning. 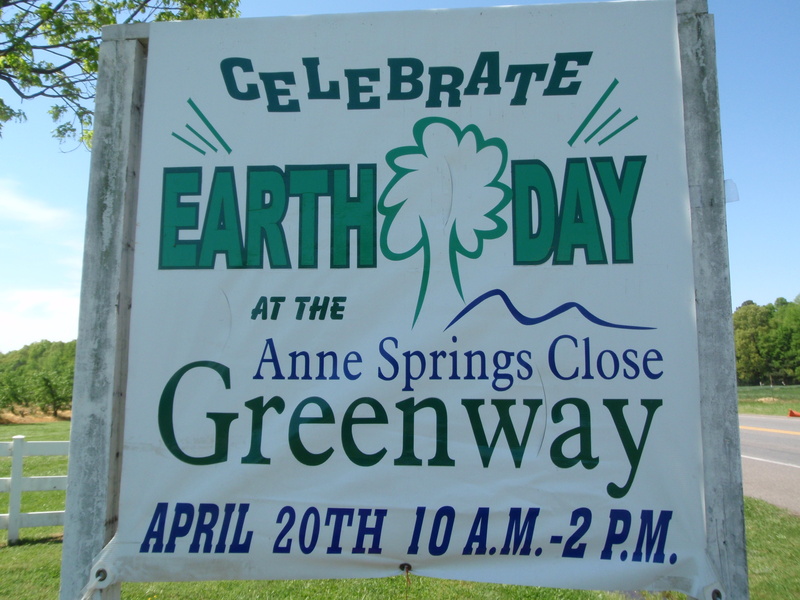 When I arrived, I saw big signs about their Earth Day celebration today (mostly in terms of a petting zoo and games and crafts for kids) and this turned out to be a 2100 acre nature preserve with miles of trails, horseback riding, nature trails, educational programs, etc. 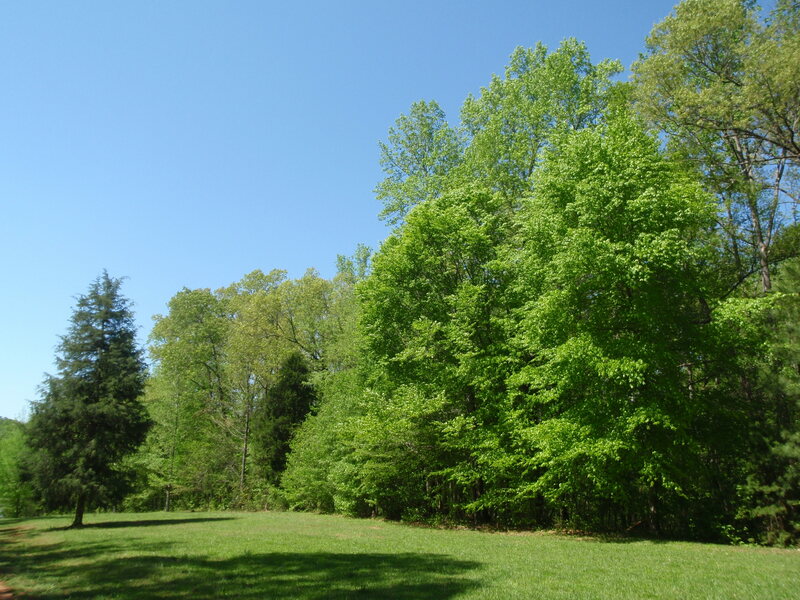 It was a beautiful place, and all this land had been donated to the public by the children of Anne Springs Close nearly 20 years ago. 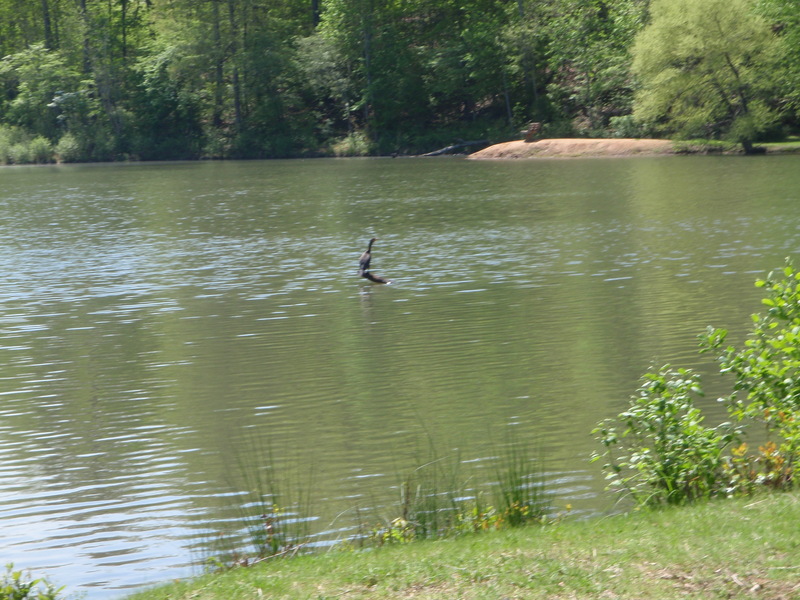 Entry fees were waived today in honor of Earth Day, and there were lots of people out enjoying the preserve and activities. 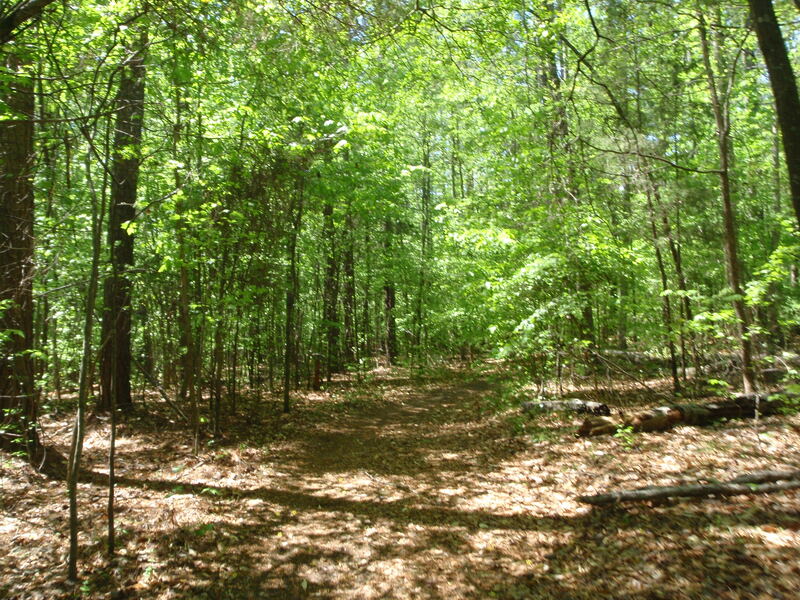 I read that they do not receive any state funding to maintain the park – that’s all done through memberships and entry fees and donations, so I knew there could be no better Earth Day donation than one to a big nature preserve that countless people enjoy! 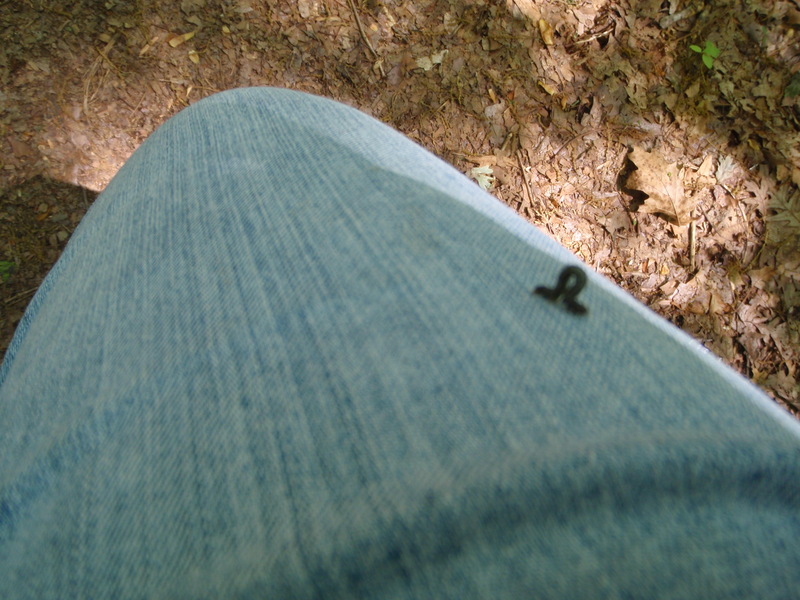 Tula and I walked about 5 miles on trails out in the hills and woods and around the small lake – some of it got a bit slippery because of the rain yesterday, but we made it through with some red mud (and lots more inchworms-they seem to be suspended from thin air!) clinging to us. 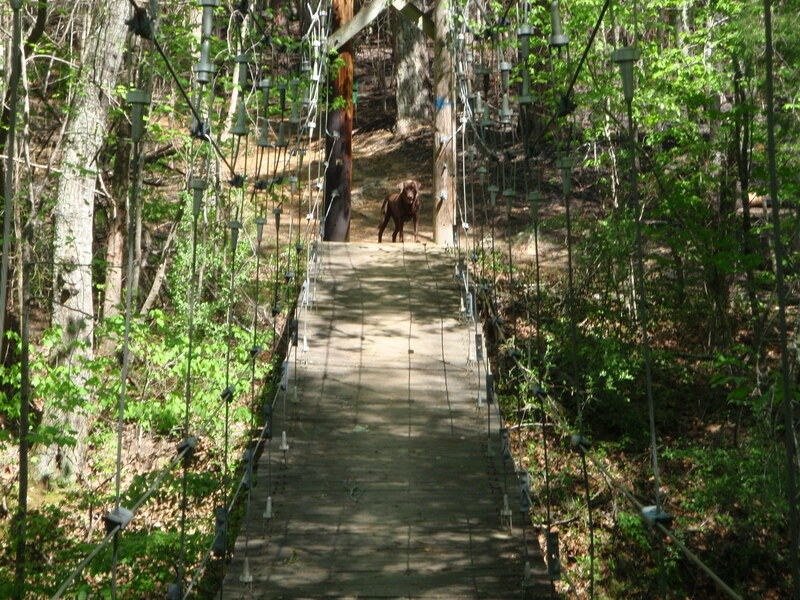 Then I was going to walk in another part of the park, but that required crossing a wiggly suspension bridge, and Tula didn’t want anything to do with that. 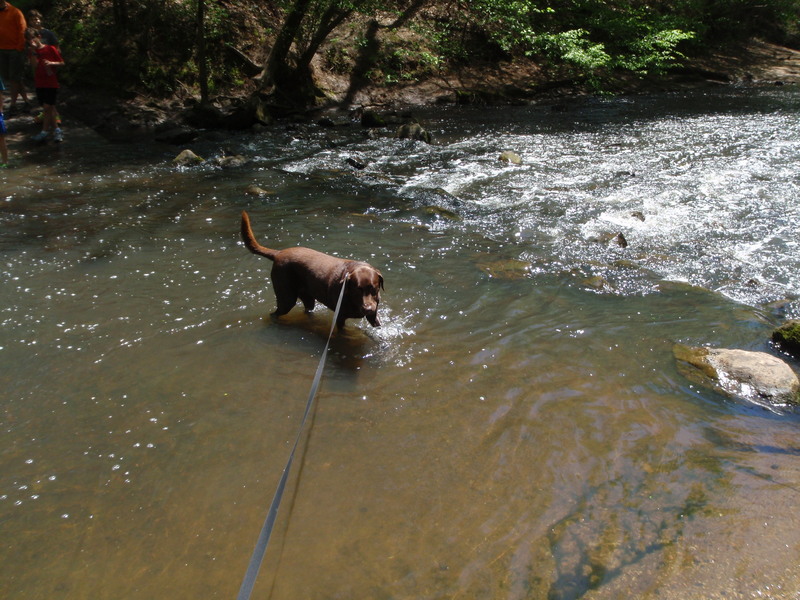 She was ready to go through the stream below, but I wasn’t sure how deep it was, although I was pretty sure other people just waded across. So I put her back in the van, and walked a couple more miles in the area across the bridge. 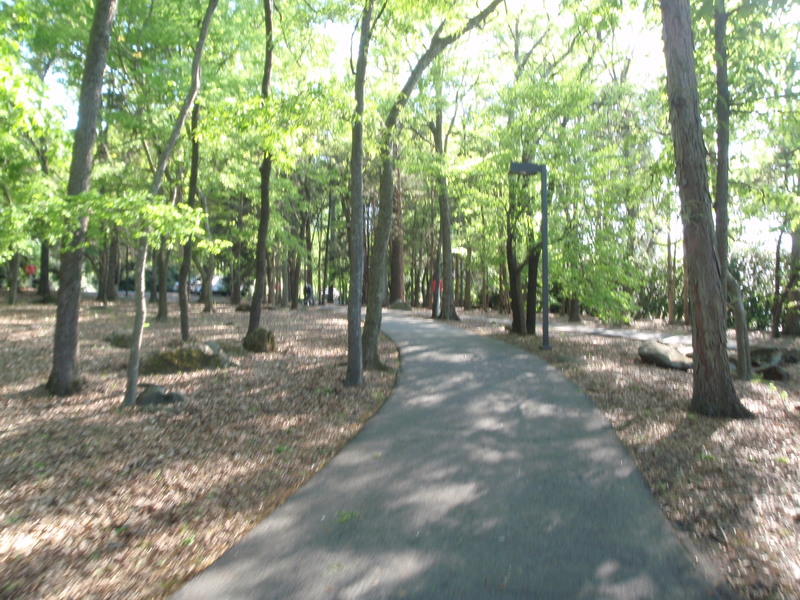 I was really happy to come across such a nice outdoor place on Earth Day – which I had forgotten about! I made my donation and then we drove to a different area of the park to walk just a little more – I wanted to see an old train trestle back there. 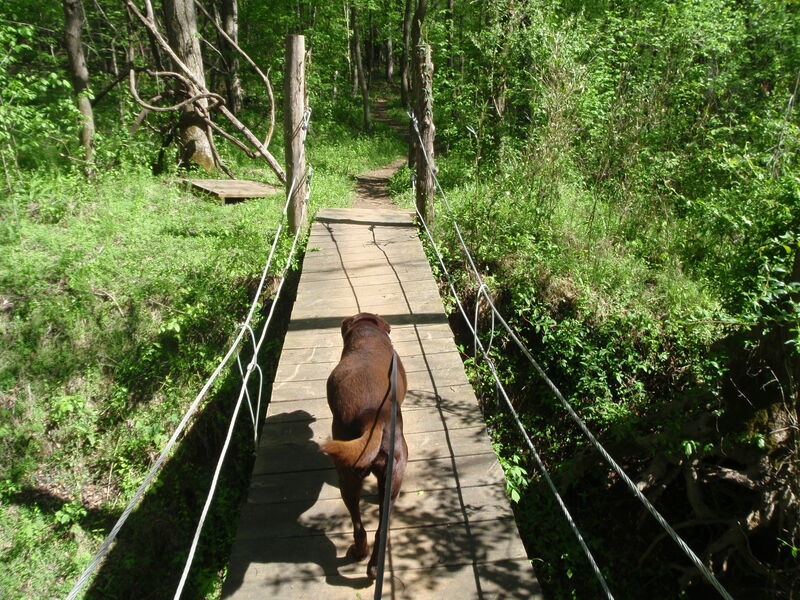 We came to another short swinging bridge which wasn’t very bouncy, and I wanted to see if Tula would follow me across if I took her leash off. 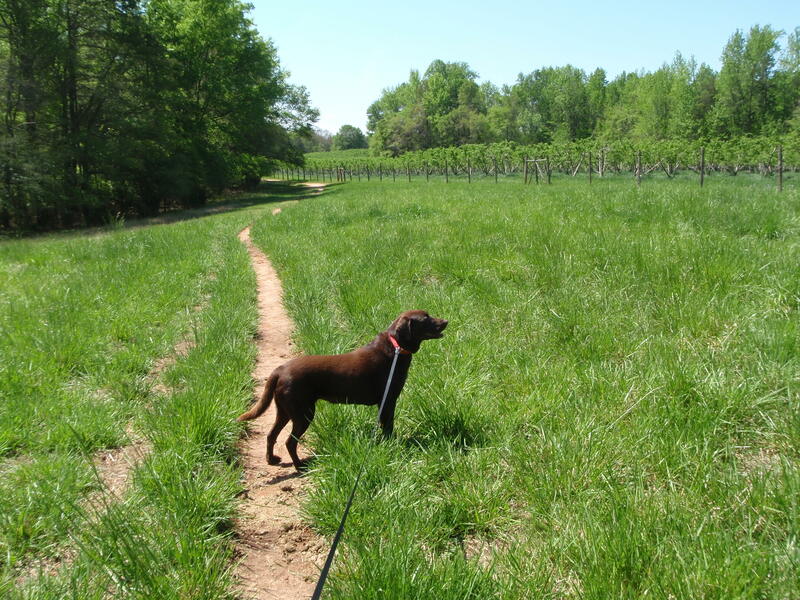 She was still afraid of the bridge, and instead, with me on the other side, she started down the ravine and was going to check out the water and come that way. 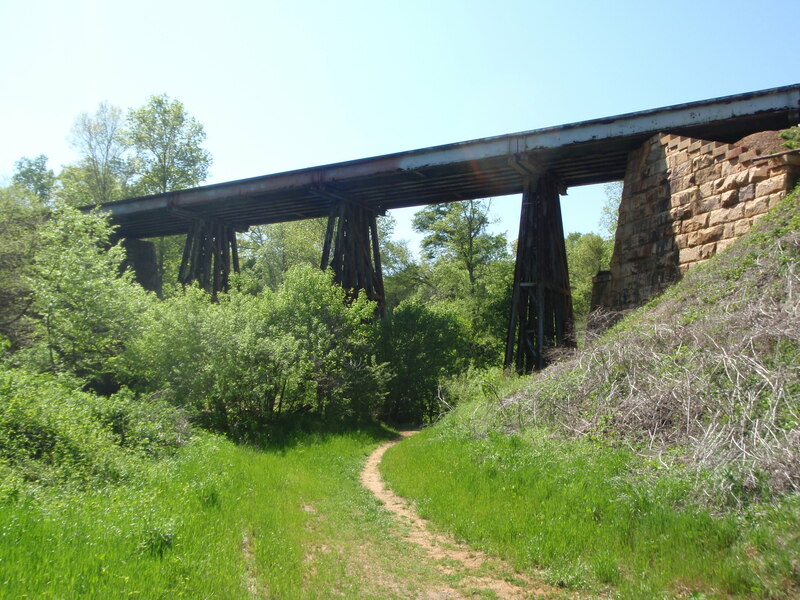 I didn’t want her to do that, so I came back across and we took another trail to the train trestle! She puts up with just about everything I do – I can certainly cross swinging bridges off my list! 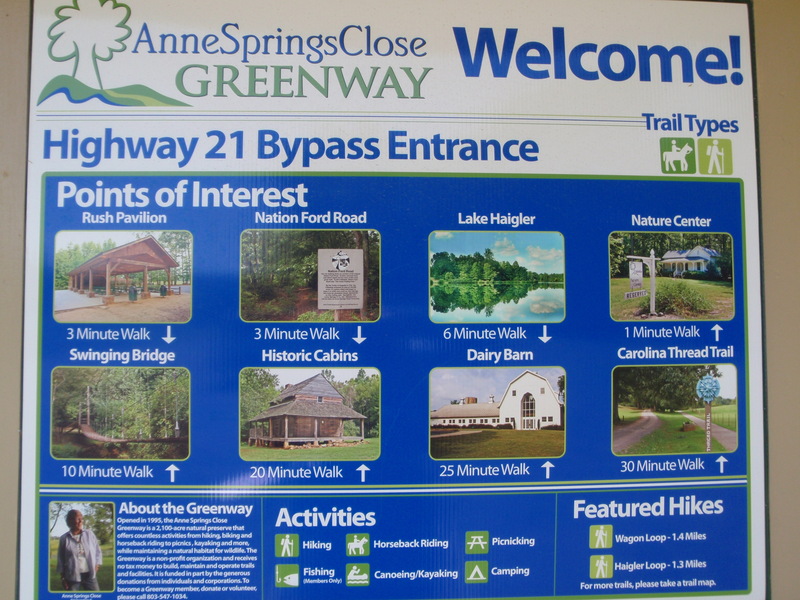 We ended up spending a good part of the day in the Greenway, and finished nearly all our walking. I’m still barely inside the South Carolina border, and I’ve already spent nearly 2 days here! 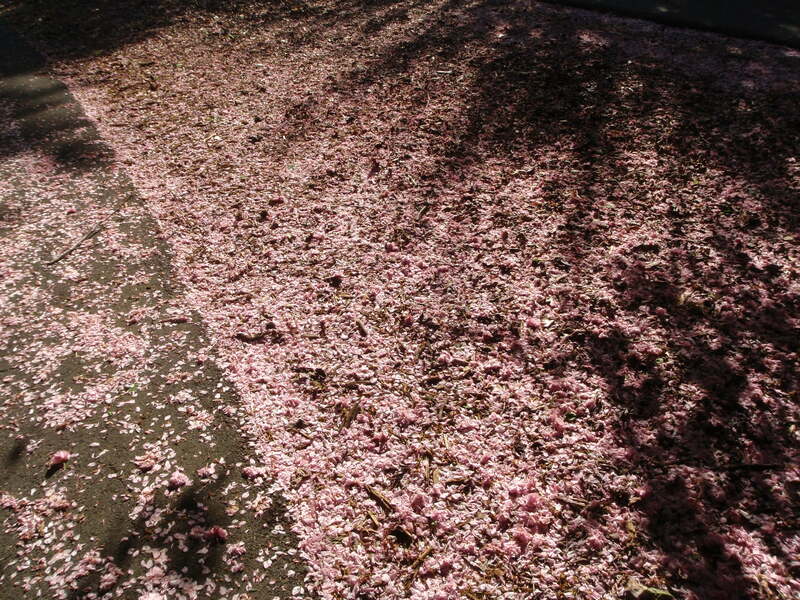 It was time to drive a little, but I stopped in the next town down, Rock Hill, and we walked a little more in a really pretty city park, where there were so many pink cherry blossoms on the ground it looked like pink snow in places! By then I had made up my mile from yesterday too, and then we headed to the Columbia area where we stopped for the night.